Heliodorus Greek Ambassador was sent to India by Bactria King Antialcidas Nikephoros, who ruled during 2nd century BCE. 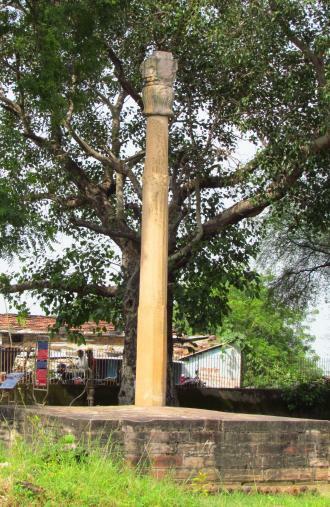 The famous Heliodorus pillar is a stone column that was erected around 113 BCE in central India in Vidisha near modern Besnagar, in Madhya Pradesh state. The pillar site is located only 5 miles from the Buddhist stupa of Sanchi. Heliodorus Greek Ambassador was sent to the court of the Shunga king Bhagabhadra. The column erected by Heliodorus first came to notice in 1877, during an archaeological survey by General Cunningham. The inscription, however, went unnoticed, because of the pillar’s thick coating of red lead (kumkum) paste. It had been the custom of local fishermen who had worshipped there to smear the column with vermillion paste, assuming the pillar as Khamb Baba ! After few years, some lettering on the lower part of the column was found and the red paste layer was removed. 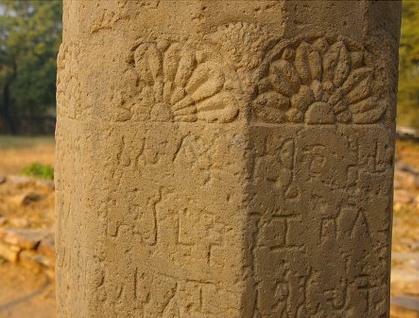 There are two inscriptions on the pillar. The first inscription describes in Brahmi script the situation of Heliodorus and his relationship to the Shunga Empire and the Indo-Greek Kingdom in prakrit language. Translation : This Garuda-standard of Vāsudeva, the God of Gods was erected here by the devotee Heliodoros, the son of Dion, a man of Taxila, sent by the Great Yona (Yavana) King Antialkidas, as ambassador to King Kasiputra Bhagabhadra, the Savior son of the princess from Varanasi, in the fourteenth year of his reign. The inscription is referring to Heliodoros as a Bhagavata (One devoted to Bhagavan), which is a common term used with followers of Bhagavan Vishnu. Translation : Three immortal precepts (footsteps), when practiced lead to heaven: self-restraint, charity, consciousness. From the inscriptions it is seems clear Heliodorus was influenced by Vaishavism, that he could be considered to be a Vaishnava, a follower or worshipper of Lord Vishnu. Heliodorus was presumably not the only foreigner who converted to Vaishnava devotional practices, although he might have been the only one who erected a column, at least one that is still extant. Certainly there must have been many others. The pillar was surmounted by a sculpture of the eagle Garuda and was apparently dedicated by Heliodorus to Vāsudeva, called god of gods, in front of the temple of Vasudeva. He, along with Agathocles of the same period, would be one of the earliest recorded people who adapted to Vaishnava tradition of Hinduism. Coins minted during the time period of Antialcidas depict Dios Krishna with lotus-tipped sceptre, in front of an elephant with a bell (symbol of Taxila), surmouted by Nike holding a wreath, crowning the elephant. The coins carry the inscription “BASILEOS NIKEPHOROU ANTIALKIDOU“. These coins were also minted at the Pushkalavati mint and carry the same inscription in Kharoṣṭhī script. 1. Vaishnavism pre-dates Christianity and not the other way round (as assumed by few western historians). 2. Indians were open to foreigners adapting hinduism. They stopped the process only after muslims attacked India and started destroying temples. Antagonism developed between the Muslims and Hindus after 674 CE could to be the main reason behind the non conversion practice.